From a young age I experienced strange paranormal phenomena, I tried to ignore it and tell myself it wasn’t really happening, at one point even believing I could be going a little crazy. I had no idea why this was happening, I didn’t understand why it was happening and I had no idea how I should deal with it. As the years went by, I found ways to cope with what I experienced, but with more mature years came a mind that was curious to find out what was going on. I have always loved science and endeavoured to find answers using it, but when looking into science at its deepest levels, I found myself sliding into a realm that seemed as strange as I had experienced my whole life, because some scientific theories and the reality they explain aren’t like a reality we know and experience each day. As for reality, one of the most interesting things I looked into was consciousness and how it forms all that we believe is real, and what I learned was a journey in itself. As my journey began, I found a spiritualist college which was a great start for anyone taking a journey into mediumship. After that, I attended various spiritualist circles and between them, I found ways to overcome and understand the strangeness I had endured my whole life. Before my journey started I was lost, not knowing where to go for help, who I should listen to and what path to take. I like to think of myself as an average man experiencing a fun, but not out of the ordinary life and I certainly didn’t want to involve myself in mediumship and the associated paranormal phenomena that accompanied it, so starting this journey wasn’t taken lightly but what a journey it has been! I never thought I’d ever call myself a medium, but now I can and the journey was nothing like I thought it would be. After taking this journey, I reflected upon the thoughts I had before starting and how lost I had been, just wishing someone would explain what I should do, where I should go and how I should focus my mind and on what! This led me to write two books aimed at someone like I once was. That was someone who experienced things I couldn’t explain and couldn’t tell those around me what I was going through, someone who needed a helping hand and a sense of direction and as important as that, what would be experienced as the journey into mediumship began. I’ve had a fascinating journey into mediumship and I’ve also been able to use my love of science to help me feel better in coming to terms with all I’ve experienced. I hope the two books I’ve written will help you in various ways before you start your own journey. To my mind, using various aspects of science that many scientists don’t yet fully understand, gives me an edge and the strength to argue against many people who say connection to a world they cannot see isn’t possible, because many of those very people seem to have little understanding of how it could be possible, no knowledge that so much of what goes on around them can’t be explained by science and many are ignorant to so much of what is going on in their own mind. Those who say connection to a world they don’t believe exists isn’t possible can’t have looked into the world around them too closely and learned as much as they could, because if they had, they certainly wouldn’t say it isn’t possible. After all, science can believe in multiple universes and parallel worlds and be dumb when it comes to time, gravity and the world of the very small, like the subatomic world, so who’s to say there isn’t a place our energy goes to when our time is up? Between what science has taught me and with the journey I have taken into mediumship, I feel I have a better understanding of the world around me and the connections that can be made than so many who don’t have the knowledge and have never tried to gain the knowledge, but somehow believe they do! I should end with this. You may not enjoy science and what it has to offer, but at its deepest levels, it gives an insight into a world that the average person doesn’t look into. It can help a person like myself, a person taking a journey into mediumship, to understand there is so much more going on around us we don’t normally see or take an interest in. I hope as you read my books you will see that in pulling together various parts of science and explaining how the world around us isn’t all that we see with our senses, gaining an understanding of consciousness and how we can have connections to a consciousness we’re not always aware of, is essential to understanding ourselves and the connections we can have in our mediumship. It can make belief in our mediumship stronger and more powerful when arguing against those who are skeptical or just don’t believe, and last, but not least, give us a feeling that we know so much about the world we can see and the world we can’t, and that’s the best feeling of all. Read about my experiences in the books below. It’s taken many years for me to get to the stage where I’m ready to write this book. I never wanted to be seen or known as psychic or a medium and spent most of my life trying not to let people around me know my secret as I wanted to lead as normal a life as I could. It wasn’t as easy as you might expect as people’s own intuition lets them know that they’re dealing with someone who has extra senses. As time went by I wondered how many other people were out there like me who experienced many psychic and paranormal experiences but couldn’t share them with anyone for fear of being ridiculed, or worse still, made out to be a little crazy. The reason I’m ready to share my experiences now is that I can handle what’s thrown at me and I have the confidence to challenge other people’s views about what I experience. It’s also taken a good few years of not only looking into the paranormal world but also science and its theories to help me come to the realisation that I’m not bonkers to believe the things I do as there can be many more strange and crazy things happening all around us that science says is possible and those possibilities make my beliefs seem positively sane. In this book I haven’t just described some of the various paranormal experiences I’ve had. I also draw my own conclusions from them and what they could mean at a deeper level. I’ve also looked into how science and its theories can give us a connection to not only each other but the universe as a whole. I also share my experience of going to a spiritualist college and my ongoing learning curve at the circle I now attend. Scattered throughout the book are my views on various things from how it is we can sense spirits to why we wouldn’t want to live in a perfect world. I’ve also written this book to help others like me in finding answers to the questions that can arise from having a psychic ability and leading a paranormal life. I explain how I dealt with it, what I did to finally come to terms with what I have and where I am with it now. By writing this book I hope to give others like me, someone who was scared to come out of the shadows, the strength to talk about the things we experience and how we can deal with those who try to mock us. I also hope that those who aren’t sure where to turn can gain a sense of direction after seeing the path I took. Lastly, I hope that those who haven’t ever experienced the paranormal world or haven’t come into contact with a psychic medium will find it interesting to read that many of us who experience all we do can be just as puzzled by what’s happening to us. As a developing medium, there are many questions we need answers to concerning our ability, but find that many of those questions have no answers, no matter how hard we look. This this can be quite frustrating to say the least. Even when we ask fully developed mediums for answers to our questions concerning our ability, they too can only give their best guess and of course their guess is based on their particular belief, but for me this really isn’t good enough. I want at least, to find answers that, even if they leave me with a feeling that I wish to know more, they’ve given me a deeper understanding and a sense that my best guess isn’t just a particular belief, but has substance to it. If you’ve read my first book, you will know that I like science and have tried to answer many of my own questions using it. The answers I found, although still left me wanting to know more, gave me a sense of direction and gave me the tools to argue my case against those who may laugh or ridicule me as I take my journey into mediumship. In this book I describe different sides to becoming a medium. I explain the various experiences I’ve had concerning the mediums, tutors and lessons I’ve taken in the circles I’ve attended. I explain how connections are experienced, made, lost, and the ups and downs to connections made. I explain how experiences at different circles can help or hinder progress in this field and what rules and beliefs or, lack of rules and beliefs were helpful to me. I wanted this book to show as many sides to becoming a medium as possible. I had many ideas of what it was to be a medium and what would be involved in becoming one, but it turns out that many of these ideas were wrong. I wanted to give some guidance as to what sort of circle would best suit an individual and some details in the different teaching techniques that various tutors use when conducting a circle. I explain how the venue holding the circle and the various people attending, can also affect your progress when taking a journey into mediumship. As I looked deeper into various aspects of science to help me find answers to my questions, there was one question that arose time and again, and that is how consciousness plays its part in the life we live. For me, this was a question I, and of course many others, would very much like to understand. The subject of consciousness has been pondered upon by some of the world’s greatest thinkers from ancient times through to our modern times, but we’re still no closer to finding out exactly what it is. In our modern world, we have ignited a new drive to answer this question and in part, it is down to artificial intelligence, robots and those who wish to be able to put a conscious mind into it. In this book, I also give my own thoughts on consciousness and how this can be related to mediumship and spiritualism. 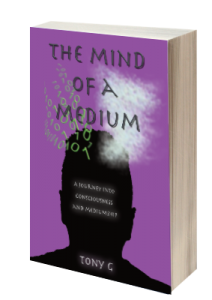 I’m hoping that after reading this book, firstly, you will have enjoyed reading my views on consciousness and next, that you have a good idea of what I went through to get to the stage I can think of myself as medium. I’ve been honest, open and frank about all I’ve experienced and tried to include as many details as possible, so that as you start your journey into mediumship, in some small way you’ve experienced a journey through me before you begin.